An international group of researchers, including scientists from the University of Southampton, has discovered seven new regions of the human genome—called loci—that are associated with increased risk of age-related macular degeneration (AMD), a leading cause of blindness. The AMD Gene Consortium, a network of international investigators representing 18 research groups, also confirmed 12 loci identified in previous studies. The findings are reported online today in the journal Nature Genetics. Supported by the National Eye Institute (NEI), a part of the National Institutes of Health, the study represents the most comprehensive genome-wide analysis of genetic variations associated with AMD. Southampton researchers, led by Professor Andrew Lotery, contributed well phenotyped and genotyped AMD samples to the consortium. In total over 17000 AMD cases were studied. AMD affects the macula, a region of the retina responsible for central vision. The retina is the layer of light-sensitive tissue in the back of the eye that houses rod and cone photoreceptor cells. Compared with the rest of the retina, the macula is especially dense with cone photoreceptors and is what humans rely on for tasks that require sharp vision, such as reading, driving, and recognizing faces. As AMD progresses, such tasks become more difficult and eventually impossible. Some kinds of AMD are treatable if detected early, but no cure exists. 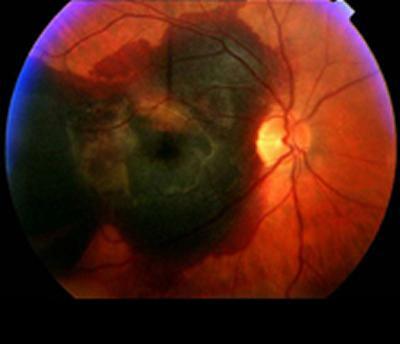 Scientists have shown that age, diet, and smoking influence a person’s risk of developing AMD. Genetics also plays a strong role. AMD often runs in families and is more common among certain ethnicities, such as Asians and people of European descent. Since the 2005 discovery that certain variations in the gene for complement factor H—a component of the immune system—are associated with major risk for AMD, research groups around the world have conducted genome-wide association studies to identify other loci that affect AMD risk. These studies were made possible by tools developed through the Human Genome Project, which mapped human genes, and related projects, such the International HapMap Project, which identified common patterns of genetic variation within the human genome.